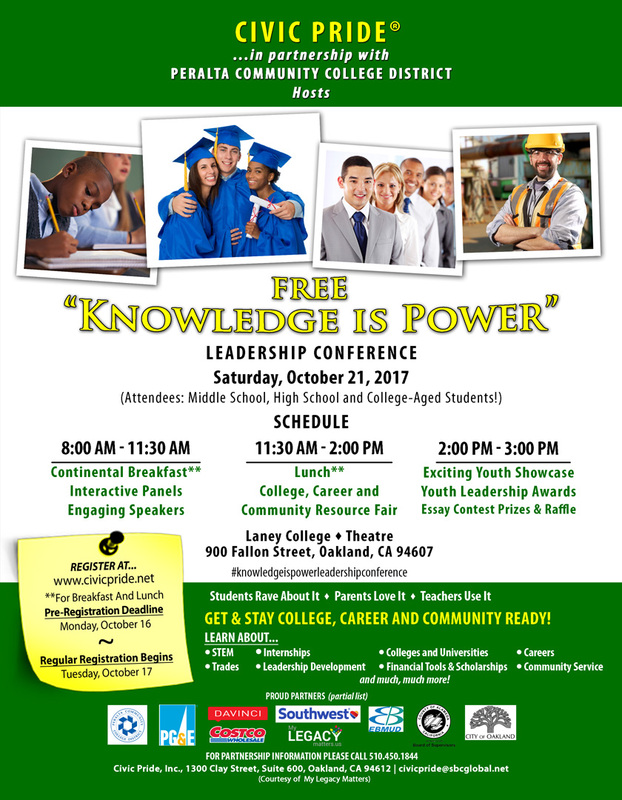 Get and stay college, career and community ready! Get feedback on resumes, courses and grades! Talk to representatives from large corporations, small businesses, entrepreneurs, public agencies, and nonprofit organizations! Have access to information on financial aid, and scholarships! Learn ways to make a difference in their community! Explore a roadmap for keeping their child on track in college and positive postsecondary experiences. community and in the workplace. Use the conference as an opportunity to give students community hours. Have a venue for helping their students stay on track for college. Provide students access to information on the requirements for well-paying craft and trade jobs. Help students connect with representatives from large corporations, small businesses, entrepreneurs, public agencies, and nonprofit organizations. Aid students in accessing information on colleges and scholarships. County of Alameda Information Tech Dept.